food | Exciting Adventures of an ex-Archaeologist, soon to be Teacher! First haul of the day – lavazza coffee and a whole load odds Bonne Maman biscuits. Yum! Celebrating graduation with tasty yummy food! It’s taken me a while to get round to mentioning it, but after Dr B’s graduation last week we went for dinner at Paul Leary’s The Woodhouse, near Loughborough http://www.thewoodhouse.co.uk/index2.htm. It.was.awesome. Since I love food I just had to share. The bread that came whilst we were waiting (which wasn’t for long, the service was excellent) was a variety of mini rolls. My favourite was the olive bread, but closely followed by the walnut bread. 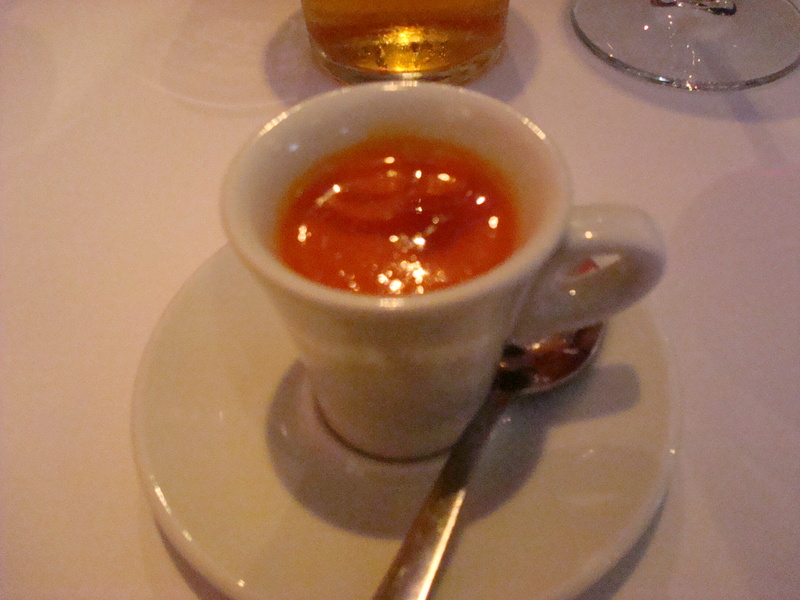 Luckily I didn’t fill up on it though, because my starter was huge and there was also an amuse – a mini tomato soup with paprika oil. 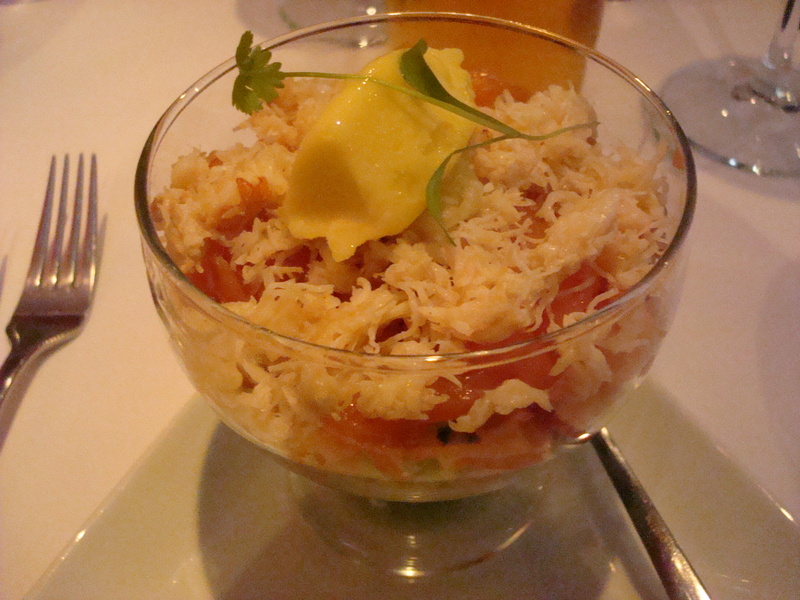 For a starter I had the Smoked Salmon and Cornish Crab Cocktail with Pink Grapefruit and Sweetcorn Sorbet. Yes, sweetcorn sorbet. My brain knew that sorbet would be cold, and expected something sweet. My brain was fooled – yes on the cold but the sweet was unexpected. It worked really well though, and really complemented the crab. I’ve been inspired to go and find/invent more savoury sorbets so keep an eye out. I had a really hard time choosing my main course, because I wanted everything on the menu. Although they looked tasty, I ditched the beef, lamb, lobster and monkfish in favour of the duck. I think I made the best choice, it may even have been the best duck I’ve had. I had breast and a confit leg, covered in sauce that had a hint of dark chocolate. It was served with seasonal greens, roasted new potatoes and a wee side of fresh cherries covered in a hazelnut crumble. The duck was super tender and the skin was perfectly crispy. The sauce wasn’t overly sweet and cut through the duck nicely. Cherries are my second favourite fruit, so having extra on the side was a bonus. I didn’t get a picture of the main course, I was too busy eating. I’d love to go back and try the tasting menu, or maybe even get round to a pudding but its a bit far for a day trip! If you find yourself near Loughborough then, first my condolences but if you get the chance then you really should try to go, even for the set price lunch. It took about 15 mins to drive there from the town so not far at all. Especially for that duck.